Golf clubs and golf balls have seen a lot of advancements over the years. The pace of evolution is, of course, driven by technology. The USGA has recently made moves to slow down the use of new technologies in golf, for fear of advancements removing the challenge from the game. I wonder what Old Tom Morris would think of the game we play today? It is certainly changed from his day. Modern clubs produce a high trajectory shot, which lands softly. Today's golf balls are designed with high backspin ratios to help stop the ball when it lands. Players of the 20th century can, therefore, stop balls quickly on today's smooth and fast greens. It was definitely not always so. The very first balls were likely just rocks, or pebbles. Wooden golf balls were the first man made balls and may have been made of hardwoods. Not much information is available regarding the wooden ball period, but it is pretty safe to assume that a wooden ball would have some interesting playing characteristics. I doubt you could "one hop and stop it". The Feathery The first "real" golf ball was known as a "feathery". The feathery was a leather sack filled by hand with boiled goose feathers, and stitched up and painted. They were expensive to make, easily damaged and only the privileged could afford them. It took a bucket of boiled goose feathers to make a single ball. A skilled ball maker could only produce about four of them in a day, and it was virtually impossible to make a truly round ball. A player may have gotten 2 rounds out of a feathery ball, but if it got wet, it would come apart. It is hard to imagine being able to keep one dry for long on the Scottish links. The feather golf ball period may have started as early as the 1400's and ended in the early 1850s. For four hundred years they were all that there was. In today's world that is absolutely amazing longevity. The Gutty The arrival of the gutta percha ball or "gutty", as it was called, revolutionized the game and allowed its spread to the masses. The gutty was made from rubber, which could be heated, and formed into a ball. The gutty period lasted from 1848 until the late 1890s. A mere blink of an eye when compared to the feathery, but it had a much greater impact on the game, by being an affordable, playable and durable ball. duck than the ones that had been scuffed up from play. Hence the practice of nicking the balls with a hammer to put dimples in them began. Dimples were incorporated into the iron molds that followed. Less paint was also discovered to be beneficial, and paint application was reduced from three to two coats. Early Rubber Core The more modern rubber core ball replaced the gutty in 1899. However, they did not meet with immediate success. Players complained that while they were longer off of the tee they were too lively on and around the greens. Once Walter Travis won the US amateur championship while playing one. The gutty soon became obsolete. Exhaustive testing has been done with different cores. A small sac of water was substituted for the rubber core at one time. Steal, lead and glycerin were all tried. Eventually most manufacturers all settled on one form of rubber or another. The composition of the rubber used is a closely guarded trade secret. Rubber thread was wound around the rubber core, as tightly as possible and a cover of Balata was applied. Today, two piece solid Syrlin covered balls are more popular with amateurs, as they are more durable than Balata. They are longer and straighter as well. Many pros are still devoted to the soft and lively Balata balls, since they can get the distance needed and prefer the added spin for control. Golf matches prior to 1850, were played with hand crafted, wooden-shafted golf clubs. Woods were long whippy hickory sticks with oversized grips and long skinny heads, which looked like elongated hockey sticks. It is amazing that players could control them at all. Blacksmiths began forging metal golf clubheads for use during the feather ball period. These were the game's first crude irons. They still had wooden shafts of course. They endured into the gutty days, up until about 1885.
clubs were made quite upright, causing the player to stand very close to the ball. This design was influenced by the game of cricket. Gutty period wooden clubs were deeper in the face and sturdier made than the feather ball period wooden clubs. 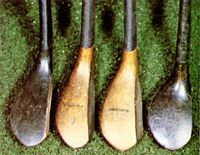 Players also started using more iron headed clubs and less wooden headed clubs as the gutty balls were hard and did more damage to the wooden clubs. The first experiments with steel shafts were a failure since they were so heavy. Perforations were introduced, but were no improvement over hickory. The answer came with high carbon steel, which was heated and tempered. The steel shaft was legalized by the USGA in 1926. Three years later the R&A followed suit. The new clubs offered a wide variety of lofts and matched sets became the norm. The old timers looked down on the new sticks. They believed that a real golfer should play a variety shots with fewer clubs. The idea of one swing and lots of clubs seemed like cheating. In 1934, a player by the name of Lawson had so many clubs that his caddy demanded extra money. In 1936, the USGA passed a rule limiting the number of clubs to 14.
from long nosed wooden clubs to semi-long nose clubs to the modern persimmon headed clubs. Between 1890 and the mid 1930's, the number of golfers grew at a rapid pace in the world. Golf companies manufactured and sold millions of wooden-shafted clubs worldwide during that 40-year period. Wooden shafted clubs remained popular well into the 1930s, despite the availability of good quality steel shafts as early as 1914. Better players started using steel shaft golf clubs in the late 1920s and early 1930s. Many traditional players resisted changing to steel, but by the mid 1930s, steel had replaced the hickory shafted clubs once and for all. Nowadays, of course, new materials abound, including graphite and titanium. With today's pace of change, who knows whats next? Prior to the 1900's, putting surfaces, for the most part, had very modest design objectives: to be playable surfaces, maintainable within the technology of the period. Early greens mowers were very crude, to say the least, when compared to today's sophisticated precision mowing equipment, which can be set to cut the greens to within millimetres of the ground. Consequently, the actual putting surfaces of old had longer blades of grass and were not nearly as smooth and consistent. They were extremely slow by today's standards. How much slower were the first greens? Is difficult to say exactly, because the stimpmeter, a simple device that accurately measures a green's speed, was not introduced until 1976. Trust me, Augusta National would have given Old Tom Morris fits. Oh, he may have learned to putt on them, but it is not at all what he was accustomed to. Turf grass too, has been greatly refined. Contemporary grasses have been developed to provide courses with many varieties that can thrive in a wide range of climatic conditions and while being cut very short. Early greens were designed with much steeper pitches than today's greens. The steepness of the slope was created to achieve a putting experience that was challenging, given the still relatively slow surface condition of the grass. Slopes of about 5 to 8 percent were pretty normal. (Greens today have pitches averaging between 1 to 4 percent). These slopes were widely utilised by designers of the day to aid the golfers in stopping the forward movement of the approach shot, slowing the ball down and holding it on the green. Our modern, smoother surfaces allow the ball to roll farther and faster. Consequently, the ball is more affected by slopes and swails. The modern low cut, along with improved turf varieties, have produced very smooth, uniform conditions. Golf certainly has progressed: the target is flatter and faster; courses are enjoying improved maintenance; the new clubs hit the ball higher; and the ball has more spin than ever before. All of these factors combined have been feeding on each other for centuries, and the game is still evolving. Thank goodness the USGA didn't put too much of a damper on progress. I would hate to see future historians stuck with nothing to talk about!